Like Chrysler (and Matra), Toyota introduced a minivan in 1984. Like the new 1984 Plymouth, Dodge, and Matra/Renault, it had a four cylinder engine and a manual transmission with an optional automatic; but it was unique in having rear wheel drive, a mid-engined design, and an optional four-speed (rather than three-speed) automatic transmission. Toyota’s unusual options included dual air-conditioners with separate controls for front and rear seat, and an ice maker/cooler box. Their minivan could seat up to seven people, and was sold in both passenger and (starting in 1985) cargo versions. While the cargo version of the Caravan/Voyager had metal, windowless sides, the Toyota Van simply deleted the seats. Like the original Chrysler minivan engines, the Toyota 2.0 needed an upgrade, and had one in 1986 — with an expansion to 2.2 liters. Toyota also added a front passenger swivel seat and interior upgrades to sweeten the deal. All wheel drive came with the 1987 Passenger Van — a two-speed transfer case (with a low gear) appeared on vans with manual transmissions, while automatics could be optioned with single-speed AWD. The 1987 Passenger Wagons also gained an optional Captain’s Chair package, with more luxurious seating for seven; an adjustable driver’s seat; and middle row chairs that swiveled and reclined. The Cargo Van had over 187 cubic feet of cargo space (155 cubic feet with the optional front passenger seat), a 2,020 pound payload capacity with the manual transmission, and a 2.2 liter electronically fuel injected engine. The van had a sliding side door and high-opening rear hatch. 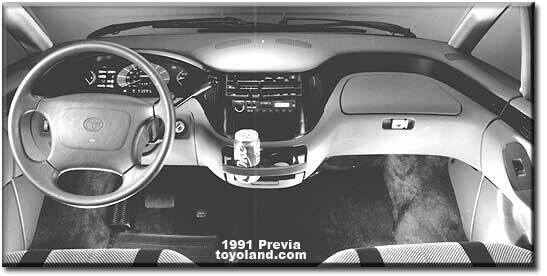 Faced with lackluster sales, Toyota redesigned and renamed the Van, resulting in the 1990 Previa (“preview”). It still had rear wheel drive and a mid-mounted four-cylinder (now 2.4 liters), and optional four wheel drive. The cargo version was dropped, but the rear seats could fold down, and the center seat could be removed to accommodate large cargo, including the infamous four by eight plywood. The Previa failed to gain much in sales, likely held back by the rear wheel drive and four-cylinder. Federal regulations brought safety changes in 1992 — a driver’s side airbag, side impact and rollover protection, and a third brake light. The Previa was the first minivan to meet all passenger car safety standards. The 1994 Previas gained a passenger side front airbag. A turbocharged Chrysler minivan had been available in 1989 and 1990, with a V6 in 1991; Toyota responded by adding a supercharger to the 1994 Previa, increasing power at the cost of requiring premium fuel. The Previa also gained leather seats, a CD player, and dual moonroofs. Still, sales were only a small fraction of the Voyager and Caravan. After 14 years of minimal Van and Previa sales in the US, Toyota introduced the 1998 Sienna — named after the color or the city — which closely followed Chrysler’s formula. That meant using a V6 engine with the front-drive Camry platform; modular seats with seatback trays; more cupholders; front and rear power outlets; and many storage compartments. Shoulder belts were used on all outboard seats, and antilock brakes and tire pressure warning were standard. One year later, the company followed up with a power door option. The 2001 Sienna had a reworked engine, with variable valve timing adding 16 horsepower, improving gas mileage, and allowing certification as a low-emissions vehicle. The company apparently celebrated by adding skid control and refreshening the interior and exterior. 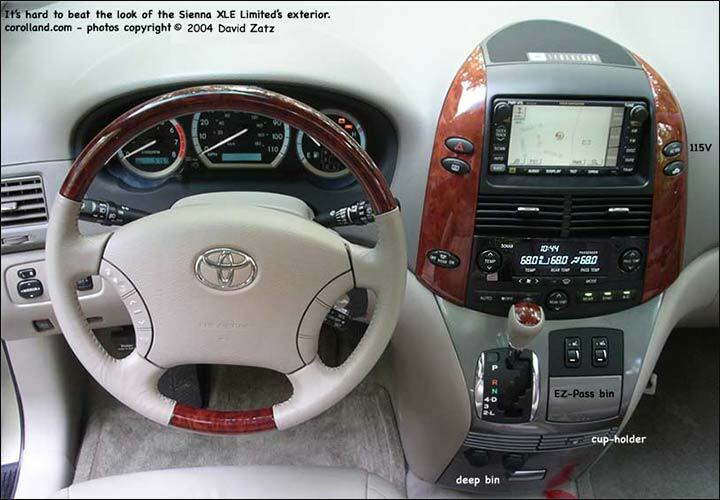 A year later, Toyota launched its first Symphony edition, with an eight-speaker JBL stereo and a various luxury features. The 2004 Sienna leapfrogged the Chrysler and Honda minivans but leapfrogged them. This generation was built in Indiana, and was 90% sourced from American suppliers. A new chassis had a four inch wider track but three foot tighter turning radius - a foot tighter than the next best minivan. The wheelbase was five inches longer, allowing the best passenger volume (45 cubic feet larger than in the 2003). The split (60/40) third row bench seats that folded flat into the floor, in a rapid, single-hand movement, were particularly attractive to buyers. 4x8 sheets of plywood could be put in, if the second row seats were removed. The new V6 produced 230 horsepower, and, coupled to a five-speed automatic, produced both the fastest sprints to 60 and the best mileage of any 2004 American minvian. The engine and transmission were both made in West Virginia. Fast brake pad wear in 2004-05 was countered with new pads. Dealers replaced some 2004-05 entertainment-system screens, because they were hard to see from the rear seat, through a Panasonic exchange program. The computer was upgraded on 2004 Siennas and some 2005 Siennas to improve response during heavy acceleration, reduce gear hunting from 20-30 mph, and make downshifts faster from 10-20 mph. This was covered for 96 months or 80,000 miles, whichever came first, so the chance to have it done is long gone. New wiper arms were introduced as a running change on the 2005s to — part 85241-20170 for the arm and 85212-13030 for the blade. Air conditioning could be lost on the 2003-2004 models, due to a bad magnetic clutch on the compressor; a revised part was created. 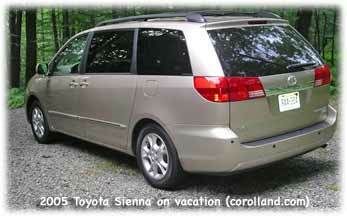 The 2011 Toyota Sienna, its third generation, brought a sporty SE and a four-cylinder variant. It was now the only minivan with an all-wheel-drive option; styled in California and partly developed in Michigan, it was built in Indiana. The wheelbase stayed the same, but the body was wider and slightly shorter; the coefficient of drag (cD) was 0.306 for lower noise and better fuel economy. Buyers could choose between the 3.5-liter V6 and a 2.7-liter four-cylinder engine (also used in the Camry); both were dual-cam designs with intelligent Dual Variable Valve Timing (VVT-i), roller rocker arms, and a variable-length intake to supply more torque on demand. The 3.5-liter V6 generated 266 horsepower at 6,200 rpm, with gas mileage ratings of 18 mpg city/24 mpg highway (16 mpg city/22 mpg highway on AWD models). With 187 horsepower at 5,800 rpm, the 2.7-liter four-cylinder engine delivers EPA-estimated fuel efficiency ratings of 19 mpg city and 26 mpg on the highway. Both engines were matched with electronically controlled six-speed transmissions; the V6 could tow up to 3,500 pounds. The suspension used front MacPherson struts, combined with rack-and pinion steering and Electronic Power Steering (EPS). Under-body aero parts also contribute to dynamic performance. Models were base, LE, SE, XLE, and Limited; AWD buyers had to get a V6 and LE, XLE, or Limited. Configurations included either seven or eight passenger seating, the difference being captain’s chairs or a bench seat in the middle row. The engine choices were present for all trim levels. All Siennas had cruise control, daytime running lights , tri-zone air conditioning, six- or eight-way-adjustable driver's captain's chair, power windows with auto up/down and jam protection, AM/FM CD player with four speakers, XM compatibility, auxiliary jack, power door locks, remote keyless entry, and three 12V outlets, among other amenities. Safety features were anti-lock brakes, electronic brake-force distribution, Brake Assist (BA), Vehicle Stability Control (VSC), and Traction Control (TRAC). The LE V6 added dual power-sliding doors and a power rear door, a power driver seat with power lumbar support, electrochromatic rearview mirror with Homelink, backup camera, rear window sunshades, AM/FM/MP3 CD player, integrated XM satellite radio (subscription required), auxiliary audio jack, USB port with iPod connectivity, and hands-free phone capability and music streaming via Bluetooth wireless technology, and steering wheel audio controls. These features can be added to the four-cylinder model as a package. The Limited had new second-row Lounge Seating and a power 60/40 third-row seat, front and rear parking sonar, dual moonroof, Smart Key, and Safety Connect. Options included HID auto high-beam auto-high beam headlamps, rain-sensing wipers, and Pre-Collision System (PCS) with Dynamic Radar Cruise Control. The SE had 19-inch alloy wheels and sat lower than other Siennas, on a sport-tuned suspension. Despite the smaller body, the interior was more than two inches longer than the 2010s, and the seats had longer ranges of travel. Toyota’s first rear-seat Dual View Entertainment Center was optional; it used two displays side-by-side to create a 16.4-inch widescreen image from a single source, or each screen could have a separate input. The minivan also had an optional backup camera which showed a 180-degree view with on-screen back-up guides. A Pre-Collision System (PCS) with pre-collision seatbelt system were optional on Limited. Seven airbags were standard, including seat-mounted side airbags for the front row and side curtain airbags to cover the length of the cabin. Safety Connect was standard on Limited and optional on XLE; it provided an automatic call to emergency services in case of a collision, a stolen vehicle locator, and buttons for roadside assistance and emergencies, with a one-year trial subscription.